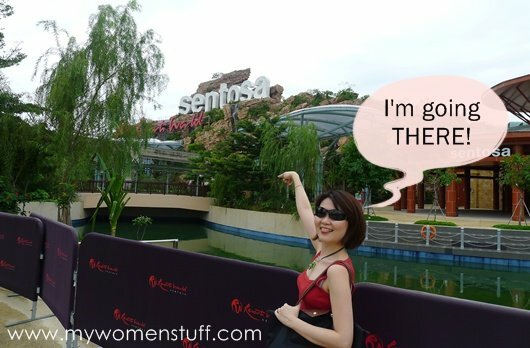 Getting into Sentosa on a weekday, it was quiet so it was easy to walk around and browse. I stopped by the Universal Studios logo, where for one moment, I carried the world on the back of my shoulders like Atlas. Little did I realize that it was at about this time that Japan was hit by that devastating earthquake and tsunami. 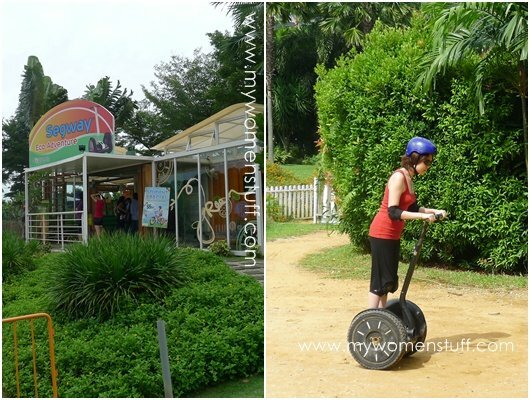 I went on the Segway Eco-Adventure on Sentosa which was fun in itself as we rode the Segway around the beach area. The company running it however needs a good rapping on the wrist. They made us wait nearly an hour for our ride to start with no explanation or assistance, refused to entertain our questions but was more concerned with selling more and more tickets (should I be surprised? ), treated me with condescension when I ran into trouble on the way (wheel ran over a rock and went off track) and were just rude. All in all, it left a bitter taste in my mouth so for that, I’d not recommend them at all. I’ve written to them with no response to date. Really. I expected so much more from a service in Singapore. They do however have monopoly on this ride so perhaps that’s why they felt they can behave in this high-handed manner. 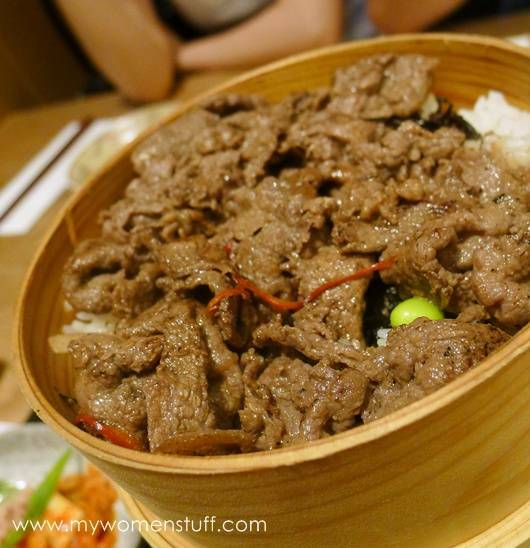 Oh and interestingly, I went on a group deal (Usual price S$38 but paid S$23.50). So that’s 2 horrible experiences from a group deal. hmm… Its no excuse though. Boo to them! Boo! Its been a while since I’ve been on a beach (man made or otherwise) so I tried getting some “cool” shots taken. 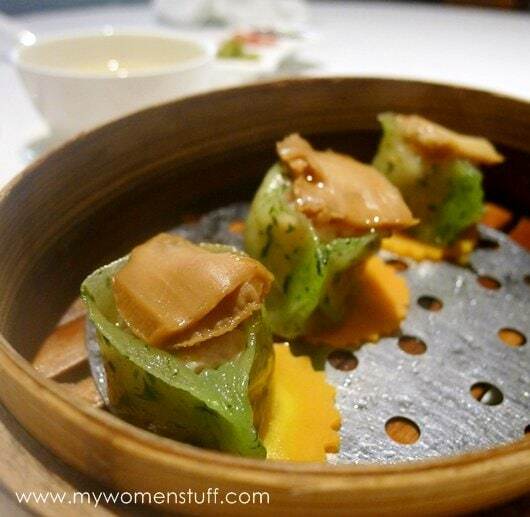 Abalone Dim Sum at Summer Palace restaurant – looks prettier than it tasted. The Stuffed Crab (not shown) is tastier than it looks! So that was my weekend in Singapore. It was fun, I didn’t do any shopping but just ate and ate and err… ate; caught up with my sis; thought long and hard about whether I wanted to buy a DSLR camera (and eventually deciding I wouldn’t) and all in all, had a nice little break. Coming back saw me sitting in the plane on the tarmac for close to an hour while they “checked on things”. So that was the fly in the ointment. But for RM132 what do you expect, really. I’ve stayed once in Sentosa before, I think the hotel’s name was the Beaufort? Brilliant shuttle service they had too! ^.^ Nice to know that you had a grat weekend! I didn’t go into Universal Studios. No time 🙂 It was a fun weekend – mostly spent eating haha! paris, it’s such fun to be treated with those rare candid shots of you ! love them ! for someone who we read ( a few times ! ) everyday, i’m sure a lot of us have grown to be quite fond of you. keep up the great work, stay gorgeous ( you are ! ) and thanks for maintaining this wonderful site for women. Aww… thank you Jia! 😀 You are tooooo sweet! ahahahah!! “welcome to the smallest beach in the world.hhehe so true! yeah its full of ppl, seldom go there too much ppl! aiyo i dislike poor service! 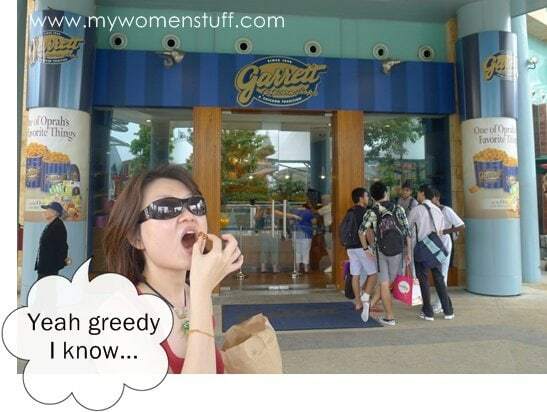 tsk esp those rude staff, makes ur blood boil when all you want is to enjoy..ggrr…guess i shall give the segway a pass if i ever wan to try haha …yes the popcorn is soo expensive! hear lots of great reviews about them then but i stop at the price -.-…its just a tiny bag! Aww, thank you 🙂 I had a SA in Guardian pharmacy ask me about the pendant too! 😀 Time for you to visit Singapore again I think eh? Looks like fun! 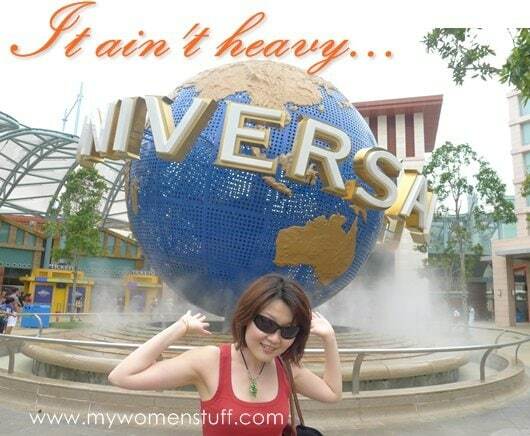 I’m planning my mini getaway to Singapura soon! Shopping, Sephora, Universal Studios & makan. Heh 🙂 Enjoy, Paris! whenever i was in sg, i ended up spending too much $, i mean who can resist sephora right? Glad you had a lovely time – I got back from Singapore yesterday. I didn’t go to Sentosa this time, maybe next trip. I ate and ate too so good for food there! The cheese one I ate tasted like artifically cheese flavoured cardboard 😛 Prefer the caramel even if I die of sugar shock from eating it haha! The bits of cashew nuts were nice though. And yes, the Segway is fun but the service is ergh! Nearly a week and no reply from them. Haha yeah its always changing. There’s always something new to see and do everywhere it seems 🙂 That’s what makes travelling so exciting. Oh, and it’s raining AGAIN….